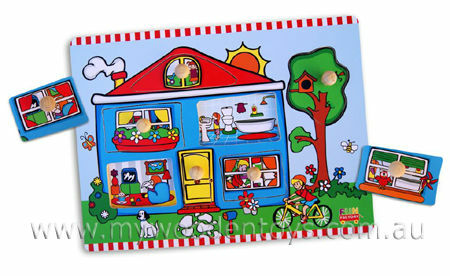 Wooden Knob Puzzle Cottage is a beautiful bright fun puzzle depicting a house and garden. The house has six removable pieces that reveal everyday scenes of a home behind them. This puzzle has wooden knobs making it great for little fingers to grab and simple drawings of everyday objects your children will recognise. Material: Wood, Gloss paper finish. We like this because: "Lots to name and recognise in this puzzle."